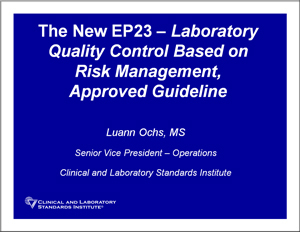 David Sterry, MT (ASCP), Director, Standards, Clinical and Laboratory Standards Institute, Wayne, PA.
Click here or on the image above for EP23 presented by Luann Ochs, MS, Senior Vice President, Operations, Clinical and Laboratory Standards Institute, Wayne, PA.
Judith Yost, MA, MT (ASCP), Director, Division of Laboratory Services, Centers for Medicare and Medicaid Services, Baltimore, MD. recipient Wendy VanDyke Memorial Grant, Cindy Graves � Gettysburg Hospital, Shelby Guhl � recipient Bill Sweger Memorial Grant, and Sandy Martin � Christiana Care Health System. 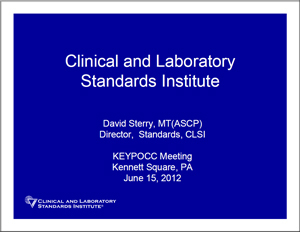 The Keystone Point-of-Care Coordinators have taken their next step in their mission of enhancing the education of those in the laboratory medicine field, particularly point-of-care testing. The group has awarded the first two scholarships to local students training in the clinical laboratory sciences. 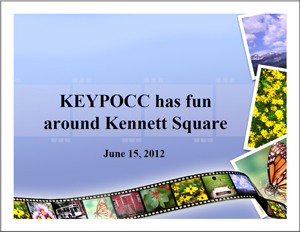 The award winners represent the values and ideals of the KEYPOCC organization. They were selected from a pool of applicants based on their outstanding record of scholarship, leadership, service, and future goals in the field of Laboratory Medicine. The awards were named in the memory of two former KEYPOCC members, Wendy VanDyke and Bill Sweger. Kelly Foster from Enola, PA was the recipient of the Wendy VanDyke Memorial Grant. She is currently working at Carlisle Regional Medical Center in point of care and is pursuing her Medical Laboratory Science degree at Weber State University in Ogden, UT with a projected December 2013 graduation date. 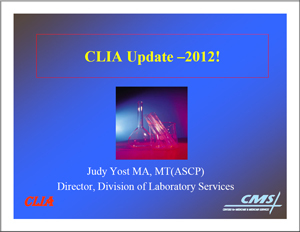 Wendy was the laboratory manager, point of care coordinator at Gettysburg Hospital, and had served as a KEYPOCC officer. She passed away in 2009 losing her long battle with breast cancer, but remains an inspiration to all who knew her. 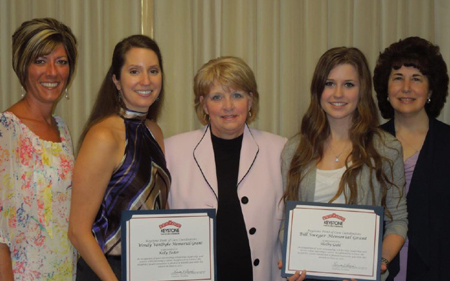 Shelby Guhl from Bear, DE was the recipient of the Bill Sweger Memorial Grant. She is currently volunteering for the Cancer Program at Union Hospital and will be working in the microbiology laboratory in the Medical Technology department as she completes her educational training at the University of Delaware. Bill was a former laboratory manager at Lancaster General Hospital, point of care coordinator at Good Samaritan Hospital and was a long time active KEYPOCC member. Bill thoroughly enjoyed teaching med tech students. He lost his yearlong battle with brain cancer and passed away in 2010.